Acrobat to Text Converter instantly converts PDF files into Microsoft Word documents that look just like the original - complete with all formatting and images! Information is set free - free to be edited and free to be integrated into your documents. Acrobat to Text software is a standalone program and does not require Microsoft Word, Adobe Acrobat, or even Acrobat Reader. Acrobat to Text is a batch PDF Converter that you can convert a lot of PDF files to word documents once time! saving your time! Acrobat to Text is a standalone software, MS Word, Adobe Acrobat and Reader NOT required! VeryPDF PDF to Word is great value for money. You can now do excellent document conversions at affordable price. 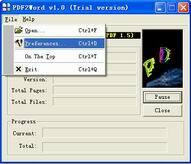 VeryPDF PDF to Word can convert PDFs generated through any application into Word. This makes this tool quite versatile.